Australia 450 and 278 (David Warner 68, Michael Clarke 57*, Ed Cowan 56, Rangana Herath 5-96) beat Sri Lanka 336 and 255 (Kumar Sangakkara 63, Thilan Samaraweera 49, Mitchell Starc 5-63) by 137 runs. The Sri Lankan batsmen fought hard until the final moments of the fifth day but the rival bowlers got through their defences and won the match for Australia. The hosts thrashed 5-450 and declared their first innings followed by 278 runs in the second. The first innings of the visitors was squeezed to 336 and they managed 255 runs in the final innings. Peter Siddle (Australia) was declared ‘Player of the match’ for his superb bowling in the game as he grasped nine wickets in two innings of Sri Lanka. 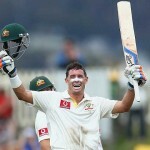 The first Test of the three match series concluded on Tuesday, December 18, 2012, at Bellerive Oval, Hobart. Earlier, Sri Lanka begun the day at 2-65 in 37 overs, the experienced Kumar Sangakkara and the skipper Mahela Jayawardene were at the crease with 18 and 5 runs respectively. They took off slowly, got just one run in the first couple of overs and later carried on with business while moving the score board. Sangakkara was the most fluent of the two and hit the first four of the day in the 43rd over as the hundred of the innings was attained in the 51st over. Mahela Jayawardene became the first victim when he was caught by Michael Clarke in the slip off Peter Siddle for 19 as the score reached 112 runs. Thilan Samaraweera joined in with Sangakkara who achieved his 40th Test fifty in the 59th over with a four. Samaraweera opened his account on the 12th ball he faced with two runs and hit a four in the 63rd over. Sangakkara survived a huge lbw shout which was referred to the third umpire without any result as the Lankan Lions scored 3-140 after 69 overs at the lunch interval. Samaraweera also survived an lbw shout on the second ball of the 74th over even after the referral but Kumar Sangakkara was declared leg before wicket off Siddle for 63 off 226 deliveries with 6 fours. The fourth wicket fell at 151 in 76 overs when Angelo Matthews associated with Samaraweera and they tried to stop the assault of the rival bowling. Michael Clarke, the captain of Australia, took the new ball after in the 84th over and Siddle delivered six balls as the play was stopped due to rain for about 20 minutes. The Kangaroos made a strange change in the bowling in the last over before the tea interval when the wicketkeeper Matthew Wade was handed over the ball by Clarke and Phillip Hughes kept the wickets. The Islanders reached 201 after 97 overs as Angelo Matthews was caught behind by Wade off Peter Siddle for 19 off 61 with 1 four. The only hope for the visitors, Thilan Samaraweera, became the next victim 17 runs later at his personal contribution of 49 from 140 deliveries with 5 fours. Prasanna Jayawardene was the other batsman who got into double figures by scoring 21 runs as the Australian bowlers removed the tail which offered a little bit resistance. The entire Sri Lankan side was bowled out for 255 runs after consuming 119.2 overs. The young gun of the Kangaroos, Mitchell Starc, bowled excellently and got the second five wickets haul of his Test career by grabbing 5-63. 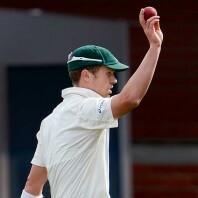 Peter Siddle impressed with 4-50 whereas Shane Watson claimed one wicket. Australia won the opening Test with a huge margin of 137 runs and leads the three Test series 1-0. The second Test will commence on the boxing day of 2012, at Melbourne Cricket Ground.